Enova No Limit Code 'Em: Tonight at Merchandise Mart! - Enova International, Inc.
Enova No Limit Code ‘Em: Tonight at Merchandise Mart! Hi All! We’re excited to announce that Enova will be hosting our first Chicago wide “Hackathon” at the Merchandise Mart this evening. We’re inviting all currently enrolled students in the Chicagoland area (and beyond). 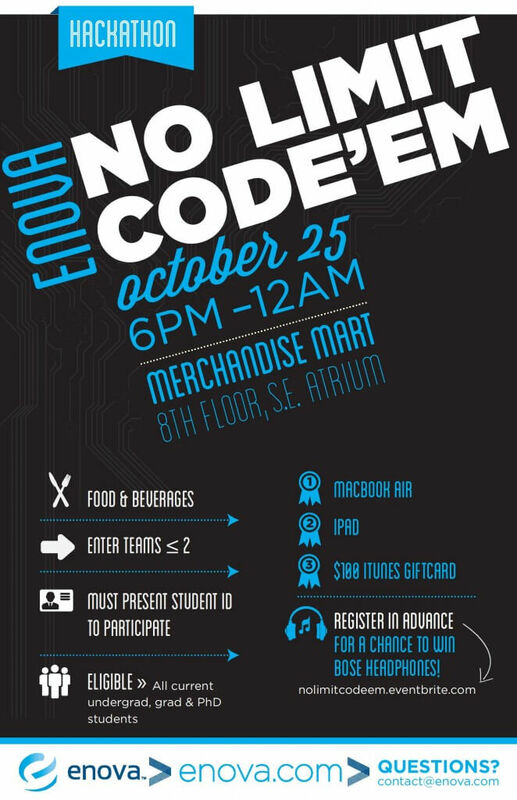 We hope to see some of you there for an unforgettable night of coding, food, and awesome prizes!